How does water temperature effect crappie? Posted by Dan Eggertsen on June 11, 2007 · Comments Off on How does water temperature effect crappie? Does the temperature of the water change the behavior of Crappies? How should my crappie fishing change as the clarity of the water changes? 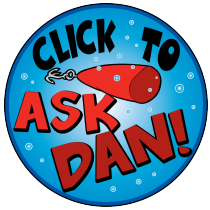 Posted by Dan Eggertsen on June 8, 2007 · Comments Off on How should my crappie fishing change as the clarity of the water changes? I’ve been told that the clarity of the water changes how you should fish for Crappie. Can you provide a brief explanation of the differences? Posted by Dan Eggertsen on April 30, 2007 · Comments Off on What is crack fishing? What’s the difference between pulling and trolling? Posted by Dan Eggertsen on April 26, 2007 · Comments Off on What’s the difference between pulling and trolling? I’ve heard a couple of Crappie fishermen use the term “pulling” as opposed to “trolling” what’s the difference? How can I catch bigger crappie? Posted by Dan Eggertsen on April 20, 2007 · Comments Off on How can I catch bigger crappie? I can usually pull in quite a few Crappie when I’m out but I’d really like to catch the “big one”. Is there anything that I can do to increase the size of the Crappie I catch? What time of year should I fish crappie? Posted by Dan Eggertsen on March 29, 2007 · Comments Off on What time of year should I fish crappie? What is the best time of year to fish for Crappie?